This book was recommended to me with little explanation, and I expected it to be just another run-of-the-mill, edgy adventure story, with a little too much language and content a little too old to comfortably call it a tween book. Wrong! Found is much more than I bargained for. It’s a fantastic, clean page-turner entirely suitable for young readers (8-13) with some mind-bending twists along the way. I had to tear myself away when the clock tipped into the wee hours this morning and finish it up at first light. Sounds good? Yeah, it is. Ms. Haddix took me by complete surprise. I had no idea where this was going, and I’m not going to give anything away. You’ll just have to read it for yourself. But make sure you have plenty of time; you won’t want to put it down either. I also recommend that you have the next book of the series handy. Found leaves you hanging, big time. 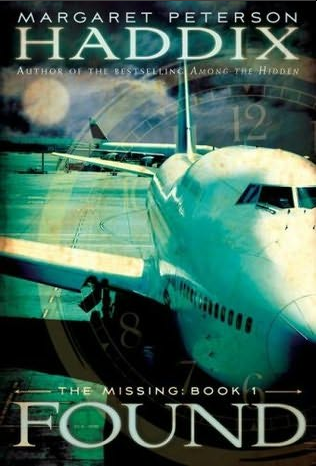 Book two, Sent, was released in 2009. Book three, Sabotaged, was released in 2010. Book four, Torn, has just been released this week. (I must get caught up!) Ms. Haddix has said on her website that three more books will be forthcoming in the series. They will be Caught, Kept, and Revealed. Watch for them!